Does it make a difference how a President dies as to how we feel about him? The Curse !!! - Have we beat it? how a President dies as to how people think about them. these words came into my mind ... The Curse!!! This is an election year ending in a 0. Will the curse be broken this time? "Soon again another American President will be assassinated - Bush"
elected in a year ending in 0. Each one was outlined with a red line. were supposed to boil all their water. George Bush and his family were watching the election returns on television. George left the room to go the bathroom and in the hallway he met Satan. Satan said: "Congratulations on winning the election and getting three more years." George said, "Thank you! But wait a minute, its a four year term." Satan said: "Our contract was for 7 years and the contract ends in three years." hundred years apart (1860 and 1960). Each wife had lost a son while living at the White House. convertible manufactured by the Ford Motor Company. Kennedy's private secretary was Lincoln. John Wilkes Booth (Lincoln's assassin) was born in 1839. Lee Harvey Oswald was born in 1939, one hundred years later. assassins were murdered before they could be brought to trial. Both the Presidents were deeply involved in civil rights for Black people. Kennedy from a warehouse and fled to a theatre. Both President's were killed by a bullet that entered the head from behind. were Southern Democrats and former Senators. assassins are of 15 letters each. assassinated Presidents have 13 letters each in their names. The "curse" actually started with William Henry Harrison in 1840. The Whigs, in 1840 presented their candidate William Henry Harrison as a simple frontier Indian fighter, living in a log cabin and drinking cider, in sharp contrast to an aristocratic champagne-sipping Van Buren. Harrison was actually of the Virginia planter aristocracy. He was born at Berkeley in 1773. He studied classics and history at Hampden-Sydney College, then began the study of medicine in Richmond. Suddenly, in 1791, Harrison switched interests. He obtained a commission as ensign in the First Infantry of the Regular Army, and headed to the Northwest, where he spent much of his life. In the campaign against the Indians, Harrison served as aide-de-camp to General "Mad Anthony" Wayne at the Battle of Fallen Timbers, which opened most of the Ohio area to settlement. After resigning from the Army in 1798, he became Secretary of the Northwest Territory, was its first delegate to Congress, and helped obtain legislation dividing the Territory into the Northwest and Indiana Territories. In 1801 he became Governor of the Indiana Territory, serving 12 years. Harrison was referred to as the hero of "Tippecanoe" hence the campaign slogan "Tippecanoe and Tyler Too!" John Tyler was the governor of Virginia who became president upen Harrison's death. 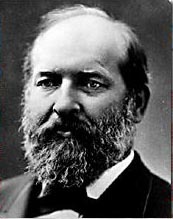 He sided with the Confederacy in the Civil War and his name was removed from the list of presidents in the White House. A legend states that Harrison was cursed by an Indian Shaman for a massacre of Native Americans at the battle for which he became famous! Harrison was a famous 'Indian Fighter' in the time period 1800-1815 - the battle of Tippecanoe took place in 1811, but the "curse" was the result of Harrison personally executing the great Indian chief Tecumseh in 1813! A few years later, Harrison resigned from the Army and entered politics. He ran against Martin Van Buren in 1836 and lost; he ran again and won in 1840 but contracted pneumonia only a few months after the inauguration and died on April 4, 1841. Notice that the date April 4, 1841 is exactly 140 years to the week that President Ronald Reagan was shot! To put it another way- Harrison contracted his fatal disease and was probably bedridden on March 30 1841 although he actually died a week later. President McKinley - Elected First term - 1896 - Elected Second term - 1900 - Shortly after 4 o'clock on September 6, 1901when one of the throng which surrounded the Presidential party, a medium-sized man, of ordinary appearance, and plainly dressed in black, approached as if to greet the President. Both Secretary Cortelyou and Mr. Milburn noticed that the man's hand was swathed in a bandage, or handkerchief; reports of bystanders differ as to which hand. He worked his way amid the stream of people up to the edge of the dais until he was within two feet of the Chief Executive. The President smiled, bowed and extended his hand in that spirit of geniality which the American people so well know, when suddenly the sharp crack of a revolver rang out loud. McKinley may have been saved if doctors knew where the bullet was lodged. Since he was shot at the Pan-American Exposition in Buffalo, NY there was an interesting new invention on display only a few yards from where McKinley lay -- the X-Ray machine! If they had carried him those few yards to this exhibit, doctors could have determined the exact location of the bullet, and would have probably been able to save his life. But as fate would have it, they did not consider the possibility and he died some days later from his wounds. Elected in 1920. Warren Harding became the 29th President. Two years into office, he died of a heart attack. Although history has not been kind to Warren G. Harding, with personal and political scandals dominating Harding historiography until the 1960s, historians have reexamined and reappraised his presidency in the past twenty years. THE STRANGE DEATHS OF PRESIDENT HARDING - WAS HE MURDERED? THE LIBRARY AND MUSEUM OF F.D.R. HARRY TRUMAN WHO SUCCEEDED FDR. 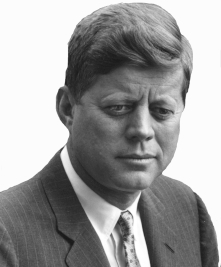 President John F. Kennedy - Elected in 1960. November 22, 1963 - President Kennedy was assassinated. He was shot as he drove through Dallas, Texas city in an open car. Ronald Reagan. Elected 1980. He was shot in 1981 getting into his car on the street and came within 1/4" of losing his life with a bullet that came that close to his heart. John W. Hinckley Jr. was acquitted by reason of insanity for shooting President Ronald Reagan in 1981. He has been held in St. Elizabeth's Hospital since his trial and has petitioned the courts to win his release. YEAR 2000 - AND THE WINNER IS????? HOW DID THE PRESIDENTS DIE?